Used 2013 GMC Sierra 1500 SLE Ext. 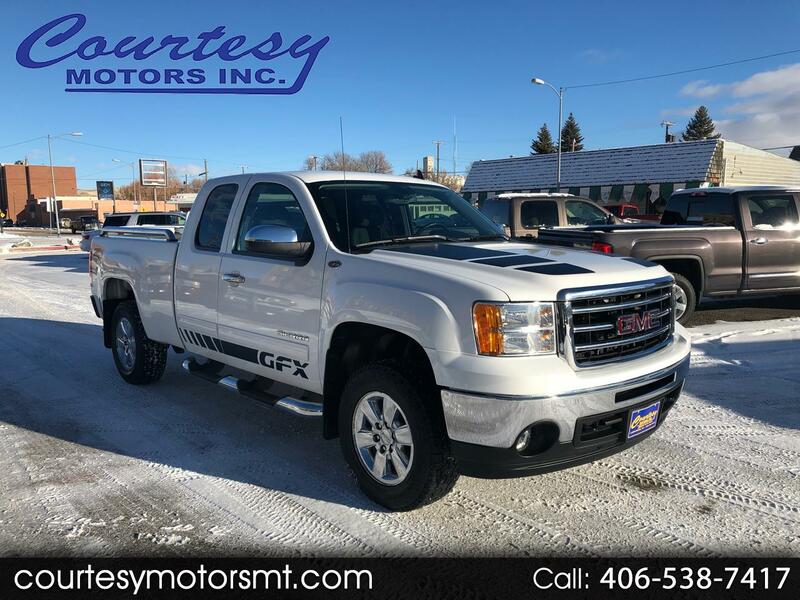 Cab 4WD for Sale in Lewistown MT 59457 Courtesy Motors Inc.
Clean Car Fax on this 2013 GMC Sierra SLE Extended Cab 4WD! Loaded with features such as: EXTERIOR PACKAGE * REMOTE VEHICLE START * POWER FOLDING O/S MIRRORS * UNIVERSAL HOME REMOTE * AUTO-DIMMING INSIDE MIRROR * FRONT FOG LAMPS. SPECIAL EDITION PACKAGE * VORTEC 5.3L V8 W/VVT (326 HP) & ACTIVE FUEL MANAGEMENT(R) * 6 SPD AUTOMATIC TRANSMISSION * H.D. COOLING PACKAGE * LOCKING REAR DIFFERENTIAL * H.D. TRAILERING PACKAGE * 17" ALUMINUM WHEELS * FRONT FOG LAMPS * 6-WAY POWER DRIVER'S SEAT * AUTOMATIC DUAL ZONE CLIMATE CONTROL * AM/FM STEREO, CD/MP3 PLAYBACK WITH USB PORT CONNECTIVITY * LEATHER WRAPPED STRG. WHEEL * AM/FM STEREO, CD/MP3 PLAYBACK WITH USB PORT CONNECTIVITY. VORTEC 5.3L V8 W/VVT (326 HP) & ACTIVE FUEL MANAGEMENT(R) * 6 SPD AUTOMATIC TRANSMISSION * H.D. COOLING PACKAGE * LOCKING REAR DIFFERENTIAL * H.D. TRAILERING PACKAGE * 17" ALUMINUM WHEELS * FRONT FOG LAMPS * 6-WAY POWER DRIVER'S SEAT * AUTOMATIC DUAL ZONE CLIMATE CONTROL * AM/FM STEREO, CD/MP3 PLAYBACK WITH USB PORT CONNECTIVITY null CHROME ACCESSORIES PACKAGE * 6" OVAL TUBULAR ASSIST STEPS (DEALER INSTALLED) * CHROME DOOR HANDLES AND MIRROR CAPS.